I love fresh pasta. It is light and soft but with a pleasing elasticity that holds it together and gives it some body. It is a completely different experience to eating dried pasta. Both are great, neither is superior to the other. They are just different. When I bought my new Kitchen Aid mixer recently, I also bought a pasta roller attachment. Today was the first time I’d had a chance to try it out. It is far easier than rolling by hand, and it solves the problem of needing three hands – one to turn the handle, one to feed the pasta in and another to catch it! Most fresh pasta recipes call for eggs to be used. Clearly that wasn’t an option, so I did a bit of hunting on the internet and discovered that fresh pasta in the region of Puglia (the heel of the Italian boot) and other parts of southern Italy and Sardinia is not made with eggs, but just flour, water and sometimes oil. Making fresh pasta is a messy business, my kitchen was covered in flour, but I think it is worth it. My first attempt was pretty good, though it looked a little pale and ghostly when it was cooked because there was no yellow colour from the egg. Apart from that the dough was great, even though I had rolled it a bit too thinly and slightly overcooked it in the blink of an eye. The other half of the batch I rolled slightly thicker and watched it eagle-eyed as it cooked, wary of leaving it too long. Perfection. I tossed it in a sauce I had simmering. It was made of olive oil, garlic, basil, zucchini and chopped fresh tomatoes from the garden, cooked until just softened and topped with some grated Vegusto Piquant. The sauce looks a strange brown colour because it is made from a mix of red, yellow, black and green tomatoes. Next up I will be trying the fresh pasta in a lasagna and I’ll also have a go at colouring it with spinach and beetroot. Mix all the ingredients together until they form a soft but not sticky ball. (I used the dough hook on my mixer, but you could do it in a food processor, or by hand. Wrap the dough in plastic wrap and allow it to rest for at least 15 minutes. Roll the dough starting at the thickest setting. Fold the dough into 4 lengthwise and rotate 90 degrees before putting the dough through again. Do this 3 or 4 times until the dough is coming out smoothly. Pass the dough through the roller adjusting the thickness on each pass until it is how you like it. I used the setting number 4 on my dough roller for the final pass. Dust with flour, fold in 4 lengthways, rotate 90 degrees and hand cut across the width. I cut mine about 1 cm so they were probably either narrow pappardelle or wide fettucine! Cook in LOTS of boiling salted water. Don't skimp on the pan size or it is likely to stick together. The pasta takes very little time to cook, I bring mine back to the boil and count to 10 then taste to see. I made fresh pasta yesterday as well! I had so many tomatoes in the garden so I made the roasted tomato sauce from Stephanie Alexander’s Kitchen Garden Companion. It’s absolutely delicious and deserved a lovely delicate pasta to go with it. 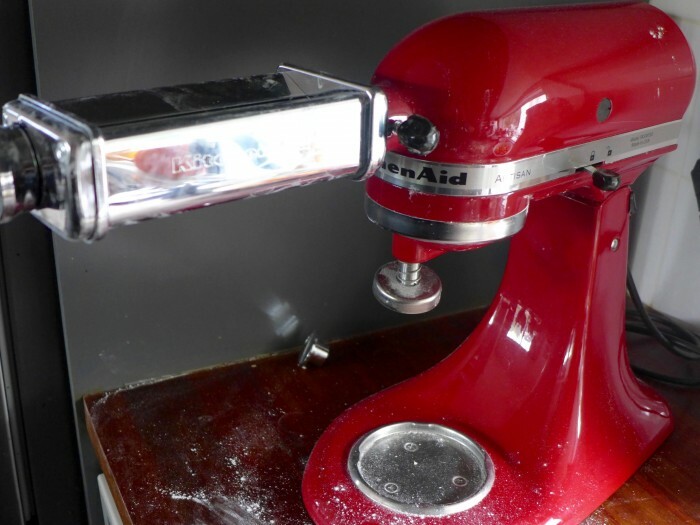 I have a manual roller, but I keep looking at the KitchenAid attachment and sounds like a good investment! I’ll be sure to try the egg free recipe next time. Looking forward to hearing about your future pasta adventures. I’ve been using a roasted tomato sauce on mine as well. I’m going to use it in the lasagna too. It is delicious. I haven’t made fresh pasta before, but it is something that I have always meant to do. Yours looks great. It is a different experience. Some things work better with dried pasta and some with fresh. 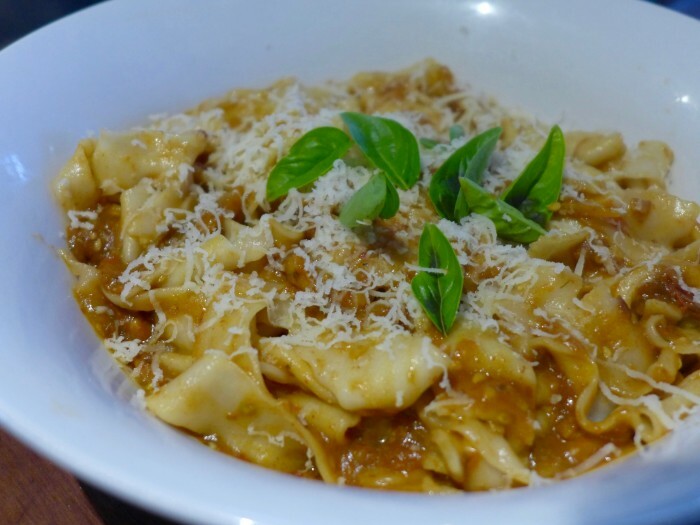 Fresh pasta with a roasted tomato sauce is simple and delicious. Ooh good on you! 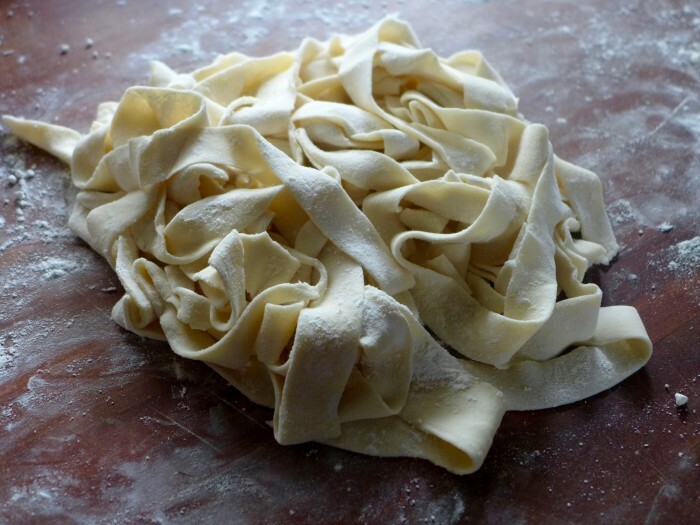 Making fresh pasta has always been on my to do list but I have never gotten around to it. It looks delightful and surely tastes that much better than the store bought stuff.